What is natural dysphagia treatment? 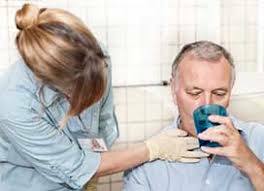 Dysphagia refers to a condition in which a person has difficulty in swallowing. It may occur when there is difficulty in the swallowing process. It may occur at any age. Sometimes dysphagia may be confused with the sore throat. But if pain occurs for a longer period of time, one should visit a qualified physician for a definite diagnosis. It is necessary to diagnose the condition at an early stage to prevent further complications. Oropharyngeal dysphagia: This occurs when there is a problem in the mouth or throat. It occurs when there is a problem in the nerves and muscles. The muscles and nerves of throat may get affected and can produce difficulty in swallowing. Esophageal dysphagia: It occurs when there is a problem in esophagus. There is some blockage or irritation in the esophagus that causes difficulty in swallowing. People complain about regular heart burn and pain when swallowing food. Age is an important factor that causes dysphagia. The muscles become weak and causes problem in swallowing. It is mostly experienced by weak and old people. It may occur when there is weakness of nerves in the spine. There is degeneration of the nerves that may causes difficulty in swallowing. Weakness and paralysis of the muscles of one side of the face which is known as Bell’s palsy is also an important cause of dysphagia. There is excessive secretion from the gastric cells that causes regurgitation of the food and inflammation of the esophagus. Multiple sclerosis is also responsible for causing dysphagia. It is condition when a person’s own immune system destroys the myelin sheath of the nerves. Exposure to radiations can also cause damage to the normal cells of the body and can harm the normal functioning of the body. Divya Avipattikar churna – It is an excellent remedies that helps to get rid of digestive problems including dysphagia. It helps to reduce the secretion of acids from the gastric cells and also prevents regurgitation. It makes swallowing easy and comfortable. Divya Kamdudha Ras – This herbal supplement helps in the natural treatment of dysphagia. It is a wonderful remedy for heartburn. It increases the strength of the muscles and nerves. It helps in relaxing the digestive system and helps in proper digestion and metabolism of food. Divya Praval Panchamrit – This is another useful remedy for dysphagia treatment. It helps to improve digestion and helps to get rid of digestion problems. 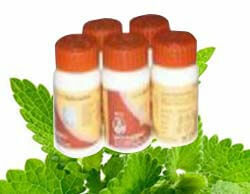 It also helps in the natural treatment of hyperacidity and constipation. It helps in healing of gastric ulcers. Divya Jahar Mohra pishti – This is a natural remedy for the treatment of digestive system disorders. It helps in quick healing. It also improves the functions of muscles and nerves. It supplies proper nourishment to the muscles and nerves. It gives relief from inflammation of the throat. Divya Mukta Pishti – This is a useful remedy that helps in the natural dysphagia treatment. It increases muscular strength. It also reduces inflammation. It boosts up the immune system and helps to get rid of weakness of throat muscles. It also reduces spasms of muscles. Mix all the remedies together. Divide in 60 parts. Take 2 part daily 1 in morning and 1 part in evening before meal with cream. People suffering from dysphagia can prevent the symptoms by taking a few precautions. Some useful tips are given here that can help to get rid of dysphagia symptoms. One should do regular gargles to increase the strength of muscles. Gargles are a good exercise that stimulates the muscles of the throat and prevents dysphagia. People suffering from dysphagia should avoid eating hard foods as this can cause inflammation of the throat. One should eat soft foods. One should try to take liquid diet as much as possible. One should eat more fruits and green leafy vegetables in boiled form to enhance the immune system and prevent recurrent inflammation. Vegetable soup also helps to provide relief from hoarseness of the throat. Warm fluids are useful for the people suffering from dysphagia. Warm fluids give relief from pain and also reduce inflammation of the throat. One should drink more water to reduce hyperacidity. It helps to remove toxins and also balances the acid secreted from the gastric cells. Water also helps in proper digestion of the food and prevents regurgitation.